There are few pleasures more delightful than musical melancholy, especially when it flows from the pen of the finest Elizabethan poets and a composer whose name will be forever associated with that emotion: John Dowland. His lute songs and consort songs form the backbone of Andreas Scholl's latest recital. The countertenor has gathered his favourite partners around him in the service of this sublime vocal art, elegantly distilling its fragile instants of grace. The songs are adroitly interspersed with instrumental pieces by Dowland's contemporaries. Bonus DVD NTSC: a performance of the song 'Venus' birds' and a documentary on the making of this recording. Since it was founded in Basel in 1989, Concerto di Viole has played as a permanent ensemble. Its four members all studied at the Schola Cantorum Basiliensis and each individual brings to it rich musical experience with well-known international ensembles. 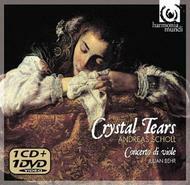 They have recorded a number of CDs, including German Baroque cantatas with Andreas Scholl for harmonia mundi in 1998.